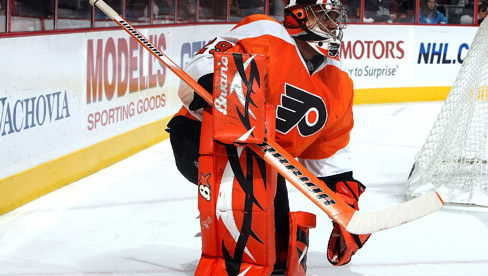 The Philadelphia Flyers have signed 6-2, 196-lb goaltender Ray Emery to a free-agent contract, according to general manager Paul Holmgren. Emery, 30 (9/28/1982), makes a return to the Flyers after previously playing for the club during the 2009-10 season. Emery is coming off his first career Stanley Cup championship with the Chicago Blackhawks, with whom he has spent the last two seasons. In 2012-13, Emery went 17-1-0 in 21 regular-season appearances, posting a 1.94 GAA and a .922 save percentage. Emery signed with the Flyers prior to the 2009-10 season and appeared in 29 games, going 16-11-1 with a 2.64 GAA and a .905 save percentage during the first half of the season. In March 2010, Emery was diagnosed with avascular necrosis in his right hip and underwent surgery in April to repair the condition. After nearly a year of recovery and rehabilitation, Emery signed with the Anaheim Ducks in February of 2011. He went 7-2-0 in 10 appearances with a 2.28 GAA and .926 save percentage to help the Ducks secure the #4 seed in the Western Conference. His comeback earned him a nomination for the Bill Masterton Memorial Trophy, awarded each year to "the National Hockey League player who best exemplifies the qualities of perseverance, sportsmanship and dedication to hockey." In 228 career NHL games for Ottawa, the Flyers, Anaheim and Chicago, Emery has posted a record of 126-63-19 with a 2.63 GAA and a .908 save percentage.